A previous student of the ESTC and The John Cass College London, Madigan has become, over an understated career spanning four decades, arguably Australia's most significant figurative carver. The female torso, the focus of much of her work, has led her to create sculptures which, at their best, have the sensuousness, subtlety and rigour of the greatest of the Indian carvings she admires. The female torso is represented in the Gallery collection by the jarrah wood 'Torso' (1954), her presentation work for the Travelling Art Scholarship, a sandstone 'Torso' (1986), which won the Wynne prize in (1986/7) and the recently gifted bronzes, 'Torso' (1986) and 'Group of three figures' (1983). 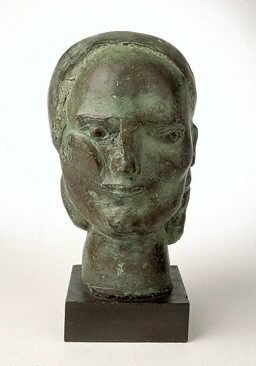 Madigan's bronze head 'Mnemosyne' on the other hand is the most significant portrait the artist has produced. Depicting both her daughter and the classical muse of Memory, it is a particularly impressive work. Signed and dated l.l. verso, incised "RM 76".